Obama meets the Dahli Lama – – – Next The Dolly Nana? 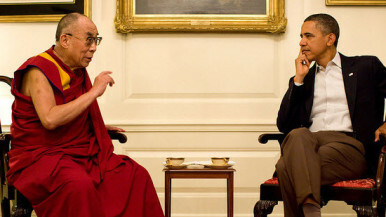 So Obama met with the Dalai Lama this week and the Chinese were not happy about it. Why should they be? They think the U.S. is supporting the people of Tibet who refuse to accept the rule of the Chinese. I do not pretend to know the intricacies of these relationships but it seems to me that although we espouse freedom, we get ourselves in trouble by not really supporting it – ie Egypt and the Middle East Spring, the Shah of Iran, etc. But then there is also the other issue of our debt to China and the fact that we are beholding to them. What? Why? When did we let this happen? The fact is that President Barack Obama would be better served if he met with The Dolly Nana and discussed ways to improve the future of our children. Sure his kids are doing great but with roughly 10% of the US unemployed and another 15% underemployed, most kids are not doing so great. Additionally, the debt that we are placing on their heads is oppressive and should be illegal. True, he is not completely responsible for the financial situation we are in at this time but he asked for the job and he got it so he must be accountable. Major, major changes are needed and it starts with the idea of spending what you earn. Right now, our government is not earning much but distrust and cynicism. In a recent discussion with my grandchildren I was taken aback by their reaction to the idea of overwhelming debt. One was very knowledgeable and angry. Another was unaware and became visibly upset by the concept. Of course it was who was upset and we spent several hours discussing how we got to this point and some options to solve the situation. I am sure his thoughts are at least as valid as those of Obama or Congress. If Obama met with the Dolly Nana, he would be charmed but disarmed. China would not care and there would be no repercussions. So why not, Mr. President?